(10/04/2019-15:30:00 PM) Bangkok (VNA) – Thailand’s Transport Ministry is planning to open a new rail route to link Sa Kaeo province, about 200 km east of Bangkok, with Cambodia to facilitate cross-border trade, and boost tourism around the eastern border of the country. (04/04/2019-14:49:00 PM) Singapore-based KrisEnergy company is expected to launch the extraction of crude oil in Cambodia in late 2019 or early 2020 but that oil will not be refined in the country. (04/04/2019-14:42:00 PM) Economic growth in Laos is expected to remain stable in 2019 and 2020 – backed by the expansion of the agriculture, energy, industry, and service sectors – according to the Vientiane Times’ quoting of the latest report of the Asian Development Bank (ADB) on April 4. (21/12/2018-10:46:00 AM) The Lao Ministry of Industry and Commerce expects the country’s exports to continue growing next year despite the challenges faced in achieving this year's target. (19/04/2019-15:06:00 PM) A two-day seminar discussing the role of State-owned enterprise (SOEs) reform in socio-economic development opened in Hanoi on April 17, as part of the Vietnam-Cuba friendly cooperation framework. 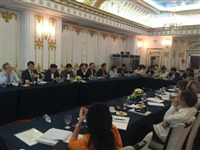 (19/04/2019-15:04:00 PM) There is great potential for trade cooperation between Vietnam and Nigeria and investment in many sectors like agriculture, agricultural processing, garment, footwear, mining, and production of construction materials, a forum heard in Ho Chi Minh City on April 16.